What if you could experience a unique detoxification that would rid you of insecurity, self-doubt, worry, fear, anxiety, and more—and all those “impurities” could be replaced with confidence, purpose, joy, and better relationships? That’s what Insecurity Detox is all about. In this book you will find thirty very doable detoxes that will help you get rid of the toxic mindsets and behaviors that pull you away from God’s truths and your best self, and replace them with a new way of thinking and acting. This progressive detoxification journey can be done in thirty days, thirty weeks, or whatever works best for you and your busy schedule. Each detox builds on the ones before, and as you journey through this unique 3-fold approach, you’ll find healing for your body, mind, and spirit. With healthy eating tips, ways to reprogram your thinking process, and meaningful principles for your spiritual life, the whole direction of your life can change. Each of the thirty chapters has three detoxes—for body, mind, and spirit—that will teach you new thought strategies and practical applications that will empower you to live with a positive perspective, grounded in God’s love and purpose for you. What we tell ourselves about ourselves either steals the joy of life from us or infuses us with ever-growing life. In this book, you will discover a new life for yourself where dreams really do come true. The Truth: You only need to be you. Instead of stretching and compressing yourself to become the person others think you should be, find the things that make your heart sing. I’ve always had a thing for scraped knees. They were my childhood specialty. Every kid gets banged-up knees, but the kids with a streak of independence seem to get even more, and I was one of those kids. My mother says I came out of the womb wanting to do my own thing. When I first started walking, I spent my summer days teetering around the concrete pool deck while my older brother Nick played with friends in the water. As a result, I spent three months with knee pads to protect me from the countless, inevitable forward-tumbles I incurred daily. Undeterred, I was eager for my next stage of development so that I could seize even more freedom. That stage came the year I discovered bicycles. I rode a tricked out, bubble-gum pink Schwinn classic with sparkly streamers on my handlebars. I was the coolest kid I knew. Eventually, one summer I earned permission to cruise solo around the block with my best friend Kelly. We pedaled in our half-mile circle for hours on end, streamers flying, feeling like we owned the world. On Wednesdays, I bicycled with my brother a distance of three miles in the neighborhood to Mrs. Otsby’s house for piano lessons. The thing I most remember from my eight years of piano has nothing to do with piano and everything to do with scraped knees. I never liked the piano much, and I absolutely hated practicing my scales, but I did love the Wednesday afternoons Nick and I got to pedal back and forth to our lessons. One memorable day, our music bag got stuck in the spokes of my wheels as I raced Nick down the hill from Mrs. Otsby’s house. What ensued was a complex combination of somersaults and pavement rolls after I was thrown over my handlebars. I emerged from the tumble with bloody knees and gravel embedded deeply into my skin from my thighs down to my shins. We returned back to Mrs. Otsby’s house, limping and bleeding into her immaculately kept home. I was never happier to see her than I was in that moment of need. It’s not that I didn’t like Mrs. Otsby; it’s just that I don’t have a single musically inclined fiber in my body. Not only am I not musically talented, but I also don’t like the process of music itself. Sure, I enjoy listening to and dancing to music, I just don’t enjoy creating it, studying it, or playing it. Music just isn’t my thing. It doesn’t make my heart sing. You know your heart is singing when you are able to lose yourself and in something you fully enjoy. For me, my heart sang when I rode my bike, swam in the pool, and wrote poems about the grass in our backyard. But instead of embracing that, I spent years of my life stretching myself and then compressing myself to fit the mold of what I thought others expected of me. If my life were an instrument, it would be an accordion. Accordions elicit their harmonic sounds through a series of pulling and pushing, or compressing and expanding the instrument’s bellows. And I pressed myself back and forth enough, contracting and expanding like an accordion in an attempt to meet the expectations of others’ or society’s often-unattainable ideals. I also let other people press and pull me apart to play their song instead of my own. And since I let other people control the accordion handles, I never knew how to be my authentic self and how to play my own song. Have you ever struggled with this as well? As we journey through this constant battle of maximizing and minimizing ourselves with someone else controlling the song, it’s no wonder that we are confused, downtrodden, and overwhelmed, wishing we could find peace with ourselves and with our life. We have been told to live or act a certain way, to achieve certain things, or to want other things, yet at the very core of who we are, we just want to be ourselves. And the key to understanding our real identity is to understand our heart. We yearn for our hearts to sing, but we are so confined by the restrictions of others that we just don’t know how. When you know what makes your heart sing, and what brings out the music in your life, your life becomes a squeezebox, emitting a melody and song as you go. Figuring out what makes your life sing is one of the first steps to claiming ownership over your personal identity. For me, movement makes me come alive. Over the years, I have honed my listening skills and heard the song of my heart for movement, independence, and exploration. My song is composed of words, writing, foreign language, travel, adventure, running, snowboarding, photography, and the color pink. Separately, like musical notes out of sequence, these passions don’t make a full song, but together, they compose a song of joy in the way I live. When you take the time to think about what you love and about what comes naturally to you, you learn something valuable that can change the quality of your life when put into application. The things that make our heart sing are the intangibles, breathed into us by God, that express themselves visibly when we give them the opportunity to do so. When we sing the song God gave us, the invisible becomes visible, and beauty emanates. Pick the accordion up; this time you’re in control and it’s your song that you are playing. It’s time to give up the gig of expanding and compressing to fit the unpredictable expectations of the world around us; time to move the instrument of your life the way it was meant to move. The song you have been given to sing is unique to you, and you will know it by listening closely to the things that you naturally love to do. To learn how to be your best self—to play the instrument of your life well—you don’t have to change. Rather, you simply need to be more of who you already are. Be a fully committed, loud version of you . . . scraped knees and all. Be “all in” with being who you are meant to be, take control of your personal accordion, and your song will be a masterpiece. A lot of people haven’t found balance in their health and wellness; not for a lack of trying and effort, but rather for a lack of clear, simple, and correct information. The multibillion-dollar diet industry has preyed on the desperation of people seeking to implement positive physical habits in their lives, and as a result, an overabundance of contradicting advice, diets, and workouts exists. Health and wellness can be much simpler than we’ve all made it out to be, and your first physical detox is intended to help you set the record straight for yourself. It’s time to simplify the information. It’s time to make reaching your optimal level of fitness and health realistically attainable to fit your lifestyle. I have four basic tenants for you to follow from here on out. Let these be the pillars of your new approach to wellness, and let them guide you to make balanced and positive decisions about what you put into your body and how you take care of your body. Sleep is one of the most underrated tenants of health and wellness. Sleep is actually an incredibly important component for successful weight loss and maintenance. The body performs its reparative functions during your sleep cycles. Furthermore, fulfilling your body’s sleep requirements actually boosts your natural metabolic rate, ultimately helping you maintain a more consistent level of high energy and natural caloric burn. Stress is a sneaky enemy that has become culturally accepted as a part of life. Not only is stress sneaky, but it also has the adverse physiological effect of releasing cortisol, also known as the stress hormone. When cortisol levels increase past their natural set point in the body, they store fat, particularly in the stomach region. So, if you want to have a flatter stomach and eliminate your love handles, eradicate stress from your life as much as you can. You can reduce your level of stress by cutting down your to-do list, by adding more sleep into your schedule, and by pursuing excellence, not perfection, in what you do. Opposite to popular opinion, the more you eat, the less you will actually weigh. In many cases, people who want to lose weight and severely restrict their caloric intake actually end up sabotaging themselves by forcing their bodies into what is commonly referred to as “starvation mode.” When one’s caloric intake is too low, the body holds on to extra fat for storage, ultimately slowing down one’s natural metabolism. Extreme calorie restriction can promote quick weight loss. However, in most cases, it is weight that is immediately gained back because of the sabotaged metabolism. To boost your metabolism, your energy, and to promote maintenance of your ideal body weight, it is important to eat wholesome and nutritionally packed food frequently throughout the day. The more you move your body, the more your body will be able to move. Being fit and active becomes easier to maintain once you have established movement as a regular part of your daily life. To move more, choose fitness activities that you enjoy—you will get the best results and you will be most consistent with exercise that you enjoy. There is no right or wrong way to exercise. Rather, there is a best way for each individual. Create a fitness and movement lifestyle that is a good fit for you and that you can implement and sustain in your day-to-day life. One of the reasons I wasted so many years as an accordion—changing myself to fit the mold dictated by those around me—is because I looked to the world around me to validate whether or not I was special or fit in. Anyone who sets out on a quest like this is certain to come back beaten down and heartbroken about themselves, and I believed the lie that I wasn’t anything special. Since I didn’t think I was special or that I had anything special to offer the world, I didn’t listen to any internal wisdom that may have been coming from God. I’m sure you’ve felt this way at some point in your life, too, that you weren’t special or had nothing to offer. This foundational lie creates a plethora of other lies that we are then susceptible to believe. Lies like being average, being not good enough, being fearful, being unlovable, being timid, and being forgettable. We must choose to overcome this mindset and to stop playing the accordion with our lives by aggressively detoxing our thoughts, in particular, the thoughts we have about ourselves. God made only one you. You are the only you to exist, in the present, in the past, or in the future. There is a reason God made you: your life—your song—gives Him great pleasure because it sings of His glory. That means that you have a unique song to sing, a song that has never been sung before and one that will never be sung again, so you must make sure it is sung. To be the best version of yourself—that is, to fulfill your purpose—you must first get to know yourself. To get to know yourself you have to slow down, get quiet, and listen to the things about life that make your heart sing. Your first spiritual detox is a self-reflective exercise to learn how to better hear the song God put on your heart and on your life. To do this, take ten minutes today to think intentionally about exactly what it is that you love to do. What are the things that make your soul sing? What would you do if you didn’t have to work, run errands, or clean the house? Exactly what are the activities and things in which you can lose yourself and lose time while doing them, the things that make you feel engaged, creative, and alive? Father, Help me hear the song You have sown into my heart, that I might learn to live with authenticity, being who You created me to be. Free me from the burden I feel to meet the expectations of others and show me how I can change my perspective to live only for Your approval, not for the approval of others. In the powerful name of Jesus, Amen. "This book will change and encourage you, beginning with the very first chapter. In these pages, you’ll discover the power to unlock the shackles that hold you back and find guidance to lasting change. Trish Blackwell is a friend who comes along beside, leading us, one step at time, to freedom!" "I love how Insecurity Detox gave me practical ways to grow in body, mind, and spirit. The daily breakdown enabled me to focus on making one small change a day. I will continue to use this book as a powerful tool to grow into a better version of myself." 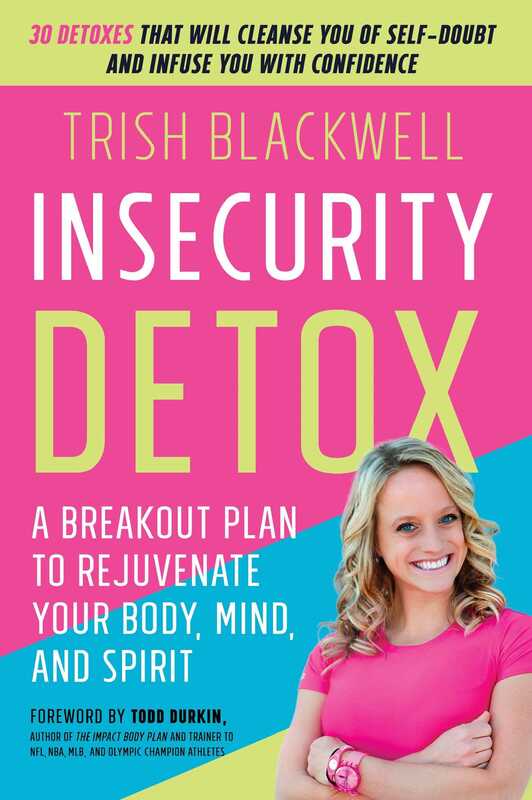 "Reading Trish Blackwell's Insecurity Detox is like receiving counsel from the wisest of friends. With the voice and warmth of a kind companion, Trish provides real, practical help to motivate you physically, inspire you mentally, and stir you spiritually to live the healthy life God abundantly desires for you." "I love how Trish uses her own struggles, stories, and steps to help us see what really matters the most; who we are in Christ." “Most detoxes on the market focus on removing things from your life, but Insecurity Detox offers a new approach to a typical cleanse. In Insecurity Detox, Blackwell walks us through ways to detox your life - mentally, physically and spiritually - by adding things back into your life. You will want to read and apply her principles again and again because they are practical, truth-based and easy to implement. This is a book about transforming your life, one detox at a time." "A toolbox for the mind, body and soul. Every Detox lesson highlights areas of life that we all come to and gives options for how to move through with grace, strength and confidence. I have gone back to this book over and over. Wonderful support at your fingertips!" "So often we focus on detoxing our bodies of sugar, alcohol and other physical intakes, but we forget about the invisible diet that our minds consume. Trish's book will guide you through a mental transformation that encourages feeding your brain thoughts of positivity, encouragement, self worth, and purpose. Through insightful words and small changes, you'll put the book down with confidence to nourish yourself in all aspects of life." "People often talk about how we are made up of mind, body, and spirit, but Insecurity Detox is the first book I have found that actually tackles all of these parts in one place. It has been put together in such a way that you can literally tackle the root causes of your personal struggles with self image and insecurity—piece by piece! Whether going through it all at once (like I did at first) or as a daily read (which I have gone back to do!) this book provides the practical tools and insights we all need to get over our deepest, and trickiest issues. I'm so thankful for this book and can't wait to share it with so many people!"